We love kids! And we are happy to provide kid’s eye exams for your little ones. Scheduling eye exams for your children should be as high a priority as general wellness check-ups. 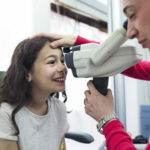 While pediatricians provide an important base level eye screening designed to detect gross eye abnormalities, the doctors at Invision recommend the first eye exam around age 5 before starting kindergarten and when visual abilities are fully functioning. The summer prior to kindergarten is an ideal time for your child’s first visit if they have never had an eye exam. time can be very busy with limited appointment times available. Many eye conditions have symptoms only identifiable by an eye doctor, that would be missed by parents or a general wellness checkup. Optometrists test for excessive or unequal amounts of nearsightedness, farsightedness, or astigmatism; developing eye movement; and eye health concerns. We also test for depth perception and color vision–tests usually only done at an eye doctor’s office. Problems that occur in vision development and eye health are easier to correct if treatment begins early. All our doctors and most of our staff have children and are experienced in examining children. They will work with you and your child to ensure your little one has a positive, comfortable, and fun experience. Don’t believe us? With over 1000 reviews for both Christiansburg and Salem, our current patients speak for us!